This morning Cass makes me a tasty breakfast of eggs and toast. She heads off to work and I get a few hours of work in at home. 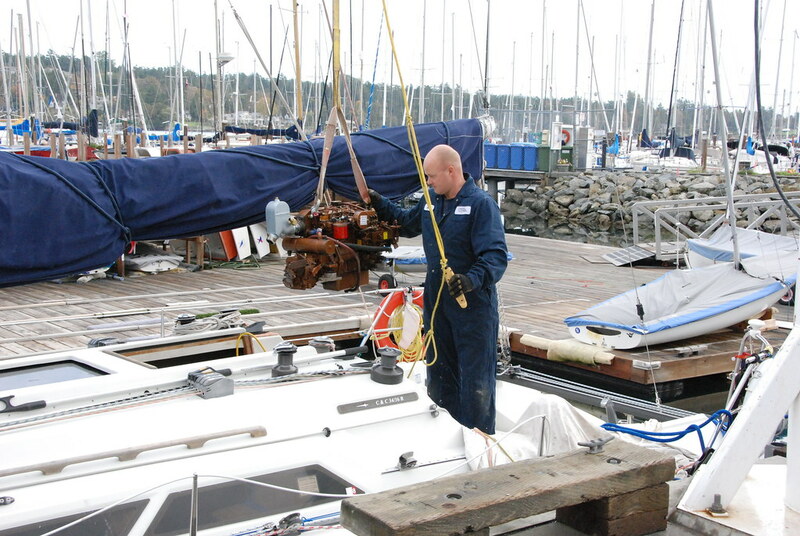 Over lunch I go down to RVYC and help the mechanics and foreshoremen move our boat under the crane. The mechanics then lift the old engine out and set the new engine in. 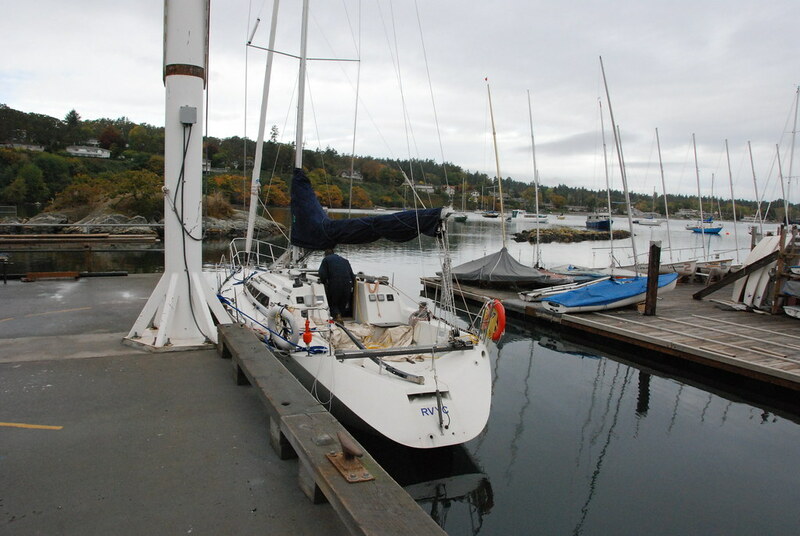 Then we tow the boat back to a slip. A milestone is reached in the project. 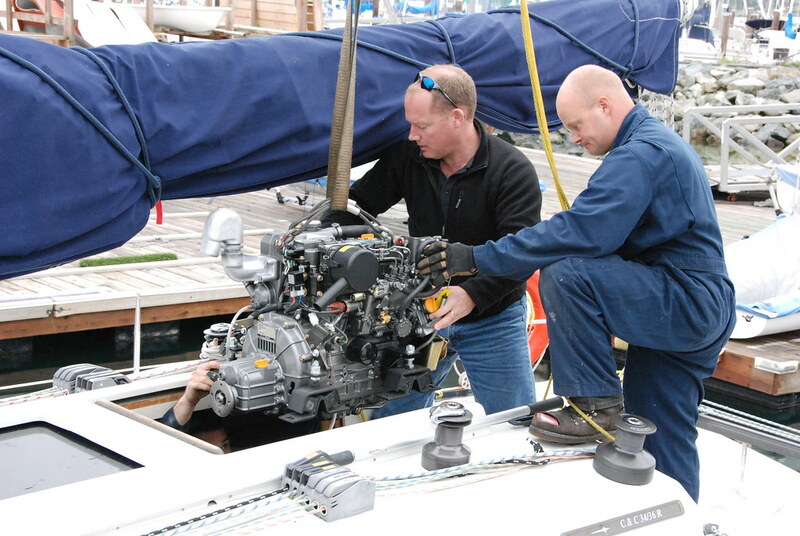 The old engine is gone and the new engine is on board, albeit not installed. After this, Cass meets me at the Shelbourne Travel Clinic and we both get our flu shots. We stop by at Pure Vanilla for lunch and I have a Nicoise Salad that truly can’t be beat. Mmmmmmmmmmmmm. Then it’s off to the VICC for my radiation treatment. I’m lying there alone in the bunker, holding totally still with my neck hyper-extended and masking tape over my chin to help me keep it still. I know that, to the end of my days, the smell of the gum on the back of masking tape will bring back the isolation of lying on the table in the treatment bunker. They are doing the shot from the back first again but this time they warn me of it so I’m not too anxious when the gantry swings around behind me. Then it swings back and they do the second, third and fourth shots from the front. I’m lying there waiting for them to come in and get me when the accelerator activates for a fifth time!! I lie there mortified with my heart beating crazily while the unplanned fifth radiation dose passes through me. My mind is screaming but I don’t dare move and cause the beam to pass through a vulnerable structure or organ. The buzzing whine seems to continue for minutes but I know it’s actually only a few seconds. I’m struggling with whether to jump up from the table when the shot ends. As soon as it’s done the technicians rush in and explain that the 4th dose was interrupted when one of them accidentally hit the door unlock button. This automatically disengages the accelerator and is a safety feature designed into the radiation treatment facility. The “fifth” shot was actually the balance of the dose prescribed for the fourth shot after they relocked the vault. I’m freaked out by what happened but I understand. I think they probably haven’t put themselves into the shoes of a patient. I know exactly how many activations the machine makes and exactly how many heartbeats each one lasts in duration. I wish they would have come in to quickly explain what had happened before completing the fourth shot so I wouldn’t have been upset. Anyway, rads are over for the week. Cass goes back to work and I come home. I’m exhausted. I think I may be starting to feel the radiation fatigue side effect. Otis and I are lying in bed watching TV and all is well. So, I’m usually a pretty steady person but accidents have happened in radiation treatments. There was an accelerator produced by Atomic Energy of Canada Limited (AECL) called the Therac-25. Due to a bug in the software that controlled the doses administered, patients could accidentally be given doses 100s of times higher than prescribed. The equipment was designed to administer low powered beams without a filter or high powered beams with a filter. The software error was a race condition. In most cases the race was resolved by the correct outcome and the accelerator performed properly… giving low powered treatments without the filter and high powered treatments with. However, if the race was resolved in the error scenario then the high powered beam blasted through the patients without the filter. Three people died and more were burned. It’s worth reading the full story by following the link above but the root cause of the problem was basically insufficient testing of the system and an overconfident development team. Thank goodness that the software I design and help implement does not cause harm or death if it errors. Another accident that I find fascinating and horrifying occurred in Goiânia, Brazil in the ’80s. A radiation treatment centre had been abandoned without properly decommissioning the gamma ray radiation equipment. A few ounces of radioactive cesium chloride was left behind rather than being properly taken to a fissionable material storage facility. Scavengers stole the lead container that the material was encased in. It was sold to a scrapyard owner who had it hammered apart and thought that the eerily glowing blue core was beautiful and wanted to use it to make a ring for his wife. The piece of cesium chloride was taken to his home and dangerous amounts of it were spread around the town, contaminating farms, soil, and houses. The wiki article is a fascinating read which I recommend. The bottom line was that the Brazilian authorities had to spend years and huge amounts of effort to clean up the mess. Four people lost their lives and hundreds received dangerous amounts of gamma radiation or ingested radioactive material. The three doctors who had run the treatment center were convicted of criminal negligence for not properly disposing of the cesium chloride. One of the things that initially puzzled me was that many of the victims of the Goiânia accident received radiation in the range from 4 to 7Gy which is much lower than my prescribed treatment of 30Gy. One difference is that I am receiving my 30Gy at the rate of 1.5Gy per day over 20 treatments spanning 28 days. The Goiânia victims received their radiation over the course of minutes or hours. Another difference is that my radiation treatments are tightly targeted to maximize therapeutic effect and minimize damage to healthy tissues. The Goiânia victims were exposed to an indiscriminate field of radiation that bathed their entire bodies. Reading these two pieces increases my respect for the radiation that is killing my cancer and affirms that fissionable material must be treated with the utmost respect. Amen.